Total Run Time: 94 min. Based on Bram Stoker's 1897 novel Dracula, filmic details were changed, including the vampire's name, when the producers couldn't secure permission from Stoker's estate. In spite of those changes, Widow Stoker sued and all prints of Nosferatu were ordered destroyed. In one of the most fortuitous slips in film history, the film was in the public domain in the United States due to an error in the copyright notice and so a print that had been shipped to the US before the destroy order was able to preserve this incredible film with its extraordinary lead performance. 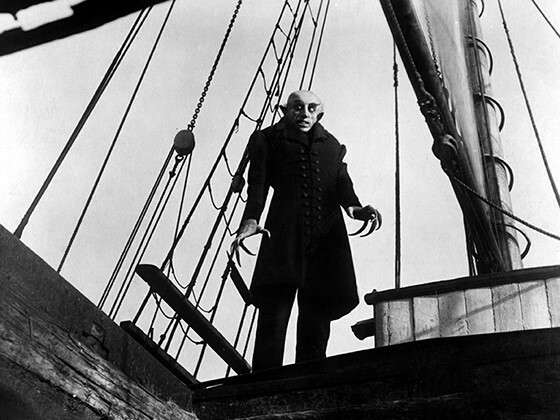 Max Schreck's otherworldly portrayal of Count Orlok contributed to rumors that he was actually a vampire!